(Hong Kong – 24 February 2013) On the occasion of Chinese Valentine’s Day, Ocean Park today made theme park history by hosting Ocean Park Extraordinary Speed Dating Party, Hong Kong’s largest-ever speed dating event. The innovative event attracted almost 100 enquiries daily, resulting in a total of over 600 applications, including from among the city’s diverse expatriate community. Dr. Allan Zeman, Chairman of Ocean Park, dressed as the Chinese mythical character of Yue-Laou, was joined by celebrity model Chrissie Chau, at today’s event to play matchmakers for over 100 single individuals – all Ocean Park fans and supporters of animal conservation. The speed dating party's participants, averaging 26.3 years of age for females and 28.6 for males, were separated into groups. Over the course of an hour, they shuttled back and forth onboard Ocean Park’s iconic cable car, getting to know each other against the romantic backdrop of the South China Sea. They kept making friends with different participants until they had found their match. Ten lucky pairs of love-struck participants were randomly drawn to take part in a race to complete secret challenges at six romantic spots within Ocean Park, including sharing a heart-shaped macaron, a dessert originally created by a 16th-century French King for his beloved wife, at Aqua City Bakery; identifying South Pole Spectacular’s three species of resident penguins; and capturing an image of one’s partner with the manta ray inside the Grand Aquarium. The champion couple received two SmartFun Annual Passes and will be treated to the Seal Encounter Programme. The first runner-up couple will enjoy the Penguin Encounter Programme and dinner for two at Neptune’s Restaurant; while the second runner-up couple will take part in the Dolphin Encounter Programme. Catering to those who wish to present a romantic surprise to their sweetheart, Ocean Park is presenting a number of special services: upon advance booking, guests can surprise their partner by declaring their love in front of a 3,000-strong audience at Ocean Theatre; presenting flowers or gifts, prepared by the guests, at the end of Dolphin or Penguin Encounter Programmes; or proposing in the partially accessible top deck of the vintage tram in Old Hong Kong. Guests who prefer impromptu moments can visit a number of romantic photo hotspots, such as Ferris Wheel, cable car and more, to capture lasting memories of love. 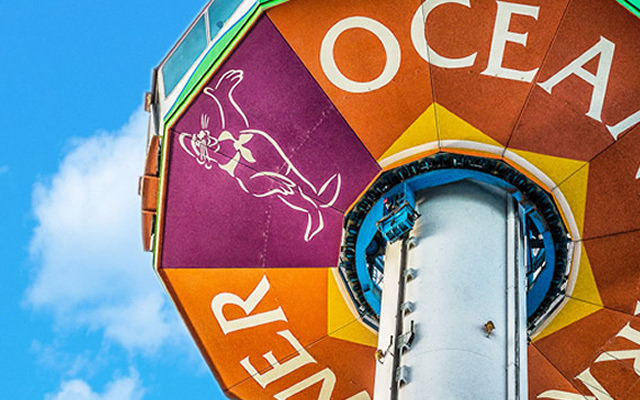 Long being a popular setting for making marriage proposals and hosting weddings, Ocean Park has its share of memorable romantic stories over its 36-year history. During 2012 alone, 36 couples tied the knot at the Park and 40 park guests have successfully proposed to their sweetheart, with a success rate of 100%. Starting in 2013, Ocean Park has been presenting marriage proposal certificates, which enable the engaged couples to enjoy discounts of up to HK$9,000 when booking wedding banquets at the Park in the future. Over ten couples have received a certificate to date.